This Garlic Roasted Chicken Crockpot Recipe and Sour Cream Blueberry Muffins Recipe makes a quick, easy and delicious meal your family will love! When using frozen blueberries in things like muffins or pancakes, do not thaw the berries before adding them to the batter. When you just have a little dab of tea left over in the pot or pitcher and you want to make another pot, pour the leftover tea into an ice cube tray and freeze. Then use the tea cubes in place of ice cubes the next time you make ice tea. The main way to reduce bad odors in the refrigerator is to really cover everything well. Sprinkle the chicken with salt, pepper, paprika. Rub the bird inside and out with garlic. Place in the crockpot. Lay a couple of pats of butter on top of the breast and pour in broth. Cook on Low 6-8 hours. Serve with the garlic butter sauce. Mix ingredients in order just until combined. Fold in blueberries. Pour into greased muffin tins 3/4 full. Sprinkle with a little sugar on top. Bake at 375 degrees for 20-25 minutes. Note: Take these muffins to the next level. When you first take them out of the oven, dip the tops into melted butter and then in a mix of cinnamon and sugar. The picture of that chicken dinner is making me so hungry. I know I will be making this recipe very soon. Thanks. Instead of mash potatoes, put foil wrapped potatoes under the chicken. Then you only need to add another veggie (if you like). You could add peeled and cut carrots under the chicken too. Then you are ready for dinner. The roasted chicken recipe would be good for game hens as well. Unfortunately, my husband’s digestive system doesn’t tolerate the white meat from chicken or domesticated turkey; he has no problem with the dark meat. But he can tolerate game hens. He has no problem with wild turkey, though. I would like to serve chicken once a week as an alternative to other meats. I also simmer the chicken carcass to make broth. Then I strain the broth and freeze it for later use. 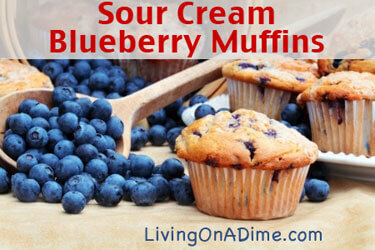 Blueberry muffins are my absolute favorite treat. Can’t wait to try these and love the freezing the tea hint. I usually make a gal of tea but sometimes I am not able to drink it before it starts to “ferment” in the fridge. I’ll put half of it in the freezer now so I won’t end up wasting it. Thanks for the tip. thanks for posting that blueberry muffins recipe .. that looks super easy to do .. and my kids LOVE blueberries .. i will def have to make this for them this week ..
What a great menu!! I just made the muffins. Super easy. I don’t have sour cream so I use greek yogurt. Thanks for this amazing website. I love living on a dime!! Thank you so much for today’s menu. My sister is languishing at home with a broken hand, and I’ve been going over every couple of days to make sure she and her son have decent meals, dishes get done, etc. This is an easy meal to make, as she has a slow cooker, and will provide leftovers that she can heat up or put into a sandwich. It came at just the right time; thanks again! Hi, I see in your blueberry muffin recipe you use biscuit mix. Do you havr a recipe for that? OMgosh! didn’t know where to put this comment! had some insomnia last nite so was watching extreme couponing at 2 a.m.! what craziness is that! there were 3 couples so proud of the donations they made to food pantries, but a lot was enhanced water and iced tea! not even food! they were towing trailers to transport it all! 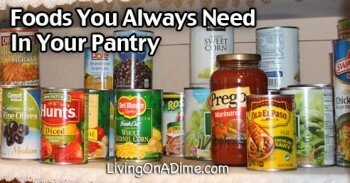 my pantry is stocked and done when: during a tight budget month we can live out of the pantry/freezer; i have 2 backup tubes of toothpaste/deodorant; when I don’t have to worry about a 3 day snow storm/hurricane. I don’t want to spend my time shopping for it, packing/putting away, counting, etc. I just got $60 worth of groceries for $38, and that was good enough for me! I do, however, go overboard with fabric stashes once in a while! LOL, a good weekend to all! 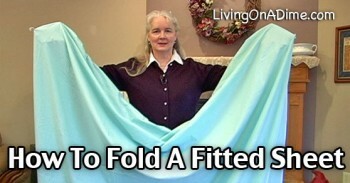 I am so so so glad I bumped into your “how to fold fitted sheets” video on facebook. Now I’m all over this website. Thank you for this easy family dinner. Will make it on Monday!! The picture looks like you browned the chicken first. If not how did you get it so brown? Carole I personally don’t usually use my crock pot as much any more but roast my chicken uncovered in the oven which causes it to be crispy and brown but Tawra uses her crock pot all the time. Sometimes too we have to use pictures that are just as close to the recipe as we can. Roasted chicken and garlic…what could be better? Crock pot meals that smell fabulous when you come in are perfect for the days that we spend all day outside working. This is such a simple idea. We are able to purchase farm raised chicken from the local Hutterites, and this is just the kind of recipe to use one in. Thank you. You are so right Mary Jane. I don’t think we always totally realize what an impact the smells in our home makes on us when the family arrives home from a long day at work or school. It can set the whole tone for the day or evening sometimes and often automatically helps us start to relax.